Investing in the future of DJing with the latest technology and old school formats. I added 2 new Denon CD players to play my collection of over 7700 CD's. Other new gear include 3 new media controllers from Denon that give me access to 100,000's of songs in under 1 second. 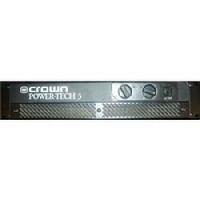 Crown Power Tech 3 and a Crown Power base 3 amps. 525 watts perside !